Oregon is filled with amazing views, incredible natural wonders, abundant wildlife and a rich history, and the epicenter of that history is Clackamas County. Just minutes from downtown Portland, Clackamas County has the birthplace of Oregon, Oregon City, where settlers would stop and file land claims or trade and start business. Outside of Oregon City, near the small town of Carver, is a snapshot into what life was like back in the 1800s, with the Baker Cabin Historical Site, visitors can take a self-guided tour and learn about life settling and setting down roots in Oregon. The 1.5-acre site, run by an all-volunteer group, called the Baker Cabin Historical Society that preserves, protects and makes the history of the Baker family and the Carver area available to the public. It does this through the Baker Cabin site, which also contains a barn and the 1895 Pioneer Church, which was moved to the site in 1967 from Springwater. During the week the site is largely unmanned, however there are several large panels around the property tell the story of the family that settled the area and operated a quarry. If you look closely when you arrive, you will see a stone with an X in it, which is where the Baker’s land claim started. Closest to the intersection of South Gronlund Road and Carver Road is the Buenker German Methodist Church, now called the “Pioneer Church.” It was built in 1894 and originally stood a few miles to the southeast near the intersection of Strowbridge and Springwater Roads. The building was moved to the Baker Cabin site in 1967 and restored in 1970-71 by the Baker Cabin Historical Society. The church is one room that is about 24-by-30 feet with double doors opening to a center aisle. The church is available for weddings and generates revenue for the society to operated and maintain the rest of the property. The property itself is beautiful surrounded by trees and has a clearing where the church, cabin and barn are located. If nothing else the site is a good spring or summer stop for a quick lunch or chance to stretch your legs. There is a short stroll to the cabin site, which was built in 1856. 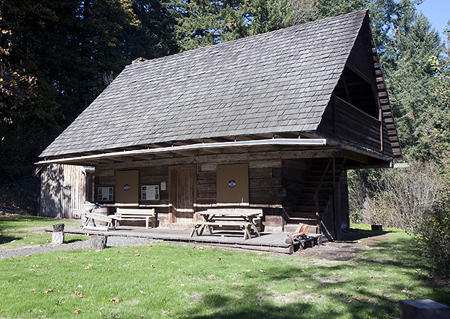 The cabin is one of the oldest log structures in the state, and it is the only known log cabin with a cantilever supported loft and exterior stairway built in Oregon during the covered wagon era. The Baker Cabin, which his 20-feet by 30-feet, was listed in the National Register of Historic Places in 1976. The cabin was occupied for around 50 years, and then abandoned in 1901. I found the cabin interesting because normally you think of a log cabin as a square box with a pitched roof. However, this cabin has a small downstairs with a staircase leading up to a larger upstairs. It’s an odd shape that I hadn’t seen before and I found it interesting. Thankfully there is a lot of information about the construction and the history of the site on the panels, so make sure to give yourself some time to read them if you are interested. But more than learning about the church and the cabin, the story of Horace and Jane Baker is also an interesting read, and learning about the risks this couple took to come to Oregon really makes one think about just how safe we have it today. Horace was a jack-of-all trades and his deeds included establishing a ferry across the Clackamas River (about a half a mile away) and also starting a quarry. Rock from the quarry was used in the historic Willamette Falls Locks and in buildings in downtown Portland. If you find yourself in Clackamas County, make sure to swing by and spend an hour learning about this pioneering couple, who personify the settler spirit that established Oregon. About Baker Cabin Historic Site: A 1.5 acre park and historic site that features a pioneer-built church and one of the oldest log cabins in Oregon. With space to walk, panels to read and learn, and nearby Carver to explore, it’s a great afternoon trip for those interested in early Oregon history. What to bring: Since most of the site is outdoors, make sure to wear weather appropriate clothing. In addition there is a “TeleTales” phone number you can call to hear the story about the Bakers and their trip to Oregon and what life was like on the site. It’s a very interesting listen and worth it if you are at all interested what life was like in early Oregon. Tip: You can get guided tours of the property by appointment, and the church is also available to rent for weddings. So contact the Baker Cabin Historical Society at www.bakercabin.org if you would like to get your own tour and hear the story from a local expert. Season: The site is open year-round, however with Oregon weather it’s best if you visit during the summer months. From I-205 (Exit #12A): Take Exit #12A at Clackamas onto Highway 212/224 for 3 1/2 miles. Internet mapping programs will find us as "Baker Cabin Site - Oregon City" Keep right at junction onto Highway 224, go 1 mile to Carver Junction. In Carver, bear to the right, down the hill, across the bridge. Turn left, go about 1/8 mile to S. Hattan Road. (across from County Park) Turn right, up the hill (heading south), go about 1/8 mile to junction of S. Gronlund Road. Baker Cabin & Pioneer Church Historical Site is on the right. From I-205 (Exit #10): Take Exit #10, Hwy 213, east toward Oregon City for 1/8 mile. Take first right, turn right again to cross under the highway. Continue through the round-about onto Clackamas River Road. If S. Clackamas River Road is open; proceed about 5 - 6 miles to stop sign. Continue straight ahead and take next right (south) onto S. Hattan Rd. Go up the hill about 1/8 mile to site at junction with S. Gronlund Road. Baker Cabin and Pioneer Church Historical Site is on the right.